Are you looking for May 2020 Orlando flights? Fares are released 11 months before departure, but it’s not too early to book. We provide advance rates on British Airways, Virgin, Norwegian and United. Let us know your requirements on our quick enquiry form. Or call us on 01934 319 851 for an instant quote. Early May is excellent value. Fly direct from Gatwick, Manchester or Glasgow at a great price. Need to fly around the 15th May 2020? It’s the school half-term holiday and prices are higher. An indirect flight from Heathrow, Manchester or Glasgow saves money on peak weekend dates. Aim for a mid-week departure. Fares are cheaper on Tuesdays and Wednesdays. Book now. An advance booking gives us plenty of time to find you a bargain. We don’t compromise on quality. We book our Florida flights with reputable airlines, including Virgin, United, Norwegian and BA. May 2020 Florida flights are available 11 months before departure. On release we check the fares and continue to monitor prices daily. We book the flights when prices are low. This simple method produces great prices for you. An early booking gives a great price for any dates. But savings are magnified if you need to incorporate half-term into your dates. You don’t have to do much for a half-term bargain. Any mid-week departure, Tuesday and Wednesday especially, is cheaper than you think. Call us now for a half-term 2020 Florida quote at a much better price than you’re expecting. Stuck with a 15th May 2020 or a 16th May 2020 departure? Can’t fly mid-week? Bargains are still available. Heathrow’s indirect Orlando flights are the solution. The journey time is few hours more, but savings are significant. How much do you expect to pay for May 2020 Orlando flights? High street fares for May 2020 Florida flights could exceed £600. Follow our advice and you could achieve fares of around £375 per adult and £295 per child. If you’d rather fly from your local airport, let us know; we book connecting flights for a supplement. Aberdeen, Inverness, Edinburgh, Isle of Man, Jersey, Exeter, Newquay and Belfast all have convenient timings. They connect into both the Virgin and BA networks. Bags are checked straight through to Orlando. Most customers fly to Orlando International for its convenient location in the heart of Florida. On peak dates, other airports may offer better value. Miami, Tampa and Fort Myers are all worth considering. If you’re planning on flying indirect via New York, why not stay a few nights in the Big Apple? The stopover is free – you only pay the price of the hotel. For more information, check out our May 2020 Florida holiday with a Manhattan stopover. Don’t wait any longer – we’ve already started taking bookings for May 2020 Orlando flights. Book early for the best chance at a low fare. Add car hire and accommodation for a great-value Florida holiday package. Book today with a deposit of £100 per person. Balances are due 90 days before departure. For more information, call us on 01934 319 851 or complete our online enquiry form. All our May 2020 Florida flights and holidays are ATOL and ABTA protected. Indirect Florida flights are excellent value on May 2020 half-term dates. 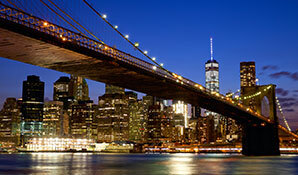 Why not take advantage with a free stopover in New York? This May 2020 Florida holiday includes Orlando flights, 3 nights in Hotel Edison Times Square and 11 nights in a named villa close to Disney. All from just £925 per person.